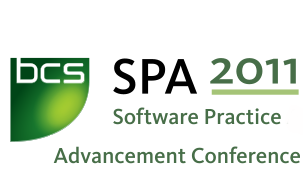 This year we’re presenting three separate sessions at the Software Practice Advancement Conference (SPA)! Read on for a run down of the sessions we’ll be leading. Sketching is not just for artists! Come along have some fun and take away ideas for visual thinking with sketches. The focus will be on communicating software design and interaction problems and solutions not flowers or life drawing… unless anyone wants to model. If you don’t already sketch, you’ll be able to add sketching to your expanding Agile toolbox of quick and simple tools for getting things done. No previous specific skills/knowledge needed. You may think you cannot draw or sketch but I will help you how to build your skills and confidence. This workshop should be relevant to anyone who wants/needs to communicate ideas quickly and effectively. In this session you’ll participate in group sketching sessions that build in complexity. We will also do some ‘trick’ exercises that make your brain flick into ‘Right brain’ mode. The aim of this session is to demonstrate what is possible with HTML5. At the moment it is a term that has been grabbed by the marketing departments…the time has come for developers to claim it back. Camera, video and sound – PhoneGap/Android 3 and coming soon.